The franchise is finally over. You would think my expectations would be high because I loved the books and the first two films, but I had such a ‘meh’ response about this because I felt like I had been waiting for it for TOO long. I was over it, and I think that wasn’t helped by a disappointing and unnecessary Part 1. BUT the good news is, this attitude paid off because it was surprisingly bloody brilliant and a worthy ending to the franchise. Tonight all the stars of The Hunger Games: Mockingjay – Part II braved the cold and wet British weather to celebrate the franchise’s finale with fans in Leicester Square. I knew nothing about Brian Wilson and the Beach Boys except their music so I was going into this with a completely open mind – I had no idea what they were supposed to look like, so that did not cloud my judgment on Paul Dano or John Cusack‘s portrayal of the troubled frontman, so my opinion is based simply on the film and the research I felt compelled to do afterwards. I desperately wanted to like this and I have been hyping it up for months so my expectations were pretty high. However, I had my reservations when they announced Mockingjay would be split into two films because I didn’t there was enough action to sustain two and I was right. 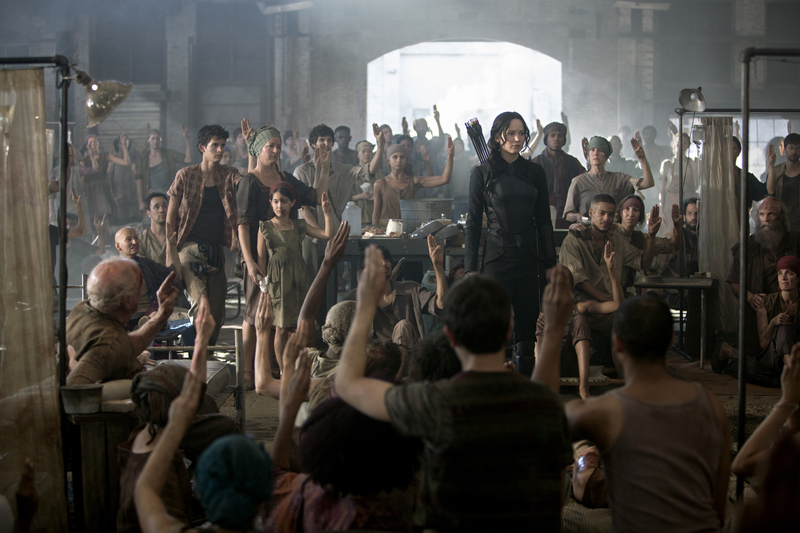 In the first half of the book, it was build-up to the rebellion and setting the scene and that is essentially what happens here – making it the dullest instalment of the franchise so far. This is not usually an event I would cover because it is more political than showbiz, but there are so many celebrities at the dinner this year than I would definitely classify it as glamorous. The White House Correspondents Dinner is an annual event which raises funds for a particular charity and is generally attended by political and business figures plus the media. The Guardian described it as a “trade association’s annual banquet”. Normally, there are plenty of famous faces but this year there seems to more famous faces than “correspondents”. So I understand the critics who say it is gone way too Hollywood and glamorous. There is even a Vanity Fair afterparty! I would agree that it has changed but I’m not complaining as it’s another red carpet event to check out! 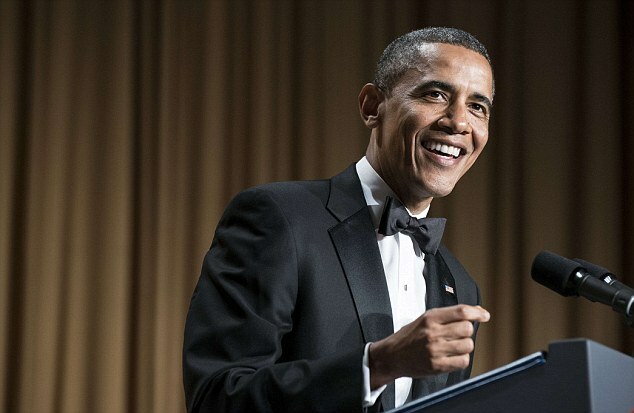 After the dinner, Barack Obama gave a humourous speech- the tradition is to take the piss out of himself, other politicians and even some media figures. He even sent-up his wife’s fringe (or “bangs”) and Jay-Z. Over Jay-Z’s trip to Cuba, he said: “I got 99 problems and now Jay-Z is one.” Consensus was that Obama was funny, however, comedian Conan O’Brien was poor and his jokes didn’t really cut it. The Washington DC Hilton was packed out with celebrities and here are the best and worst dressed. I will also list the celebrities there at the very bottom so you can understand the sheer quantity that attended. At the very, very bottom check out the spoof video that Obama made with Steven Speilberg. Okay, so besides these ladies, I will write a list of the celebrities that attended. Brace yourself, it is long! Gerard Butler, Kerry Washington, Kevin Spacey, Michael J Fox, Piers Morgan, Barbra Streisand, Amy Poehler, Olivia Munn, Matthew Perry, Psy, Steven Spielberg, Rebel Wilson, Modern Family’s Sofia Vergara, Ty Burrell and Julie Bowen, Glee’s Darren Criss and Kevin McHale, John Legend, Patricia Arquette, Nicole Kidman, Michael Douglas, Bradley Cooper, Jeremy Renner, Revenge’s Madeleine Stowe, Olivia Wilde, Jason Sudeikis, Paul Rudd, Ed Helms, Justin Bartha and How I Met Your Mother’s Josh Radnor. NOW THAT’S A LOT. Not to mention the celebs who just went to the afterparties. Can you imagine how big this dinner was?! Now check out this spoof video that Obama made with Steven Speilberg. 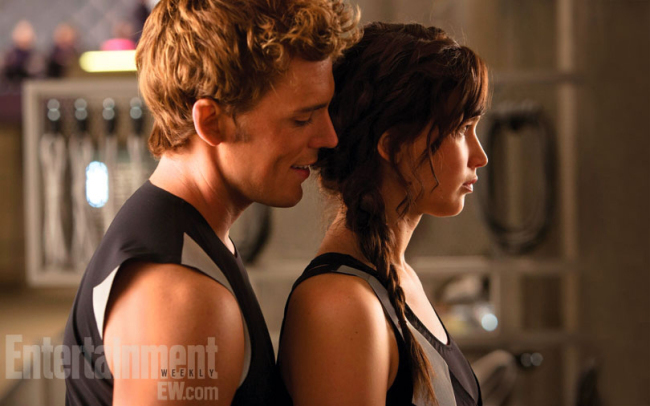 Yes, the release for The Hunger Games: Catching Fire may not be until November but we can still get excited about the new promotional material, right?! 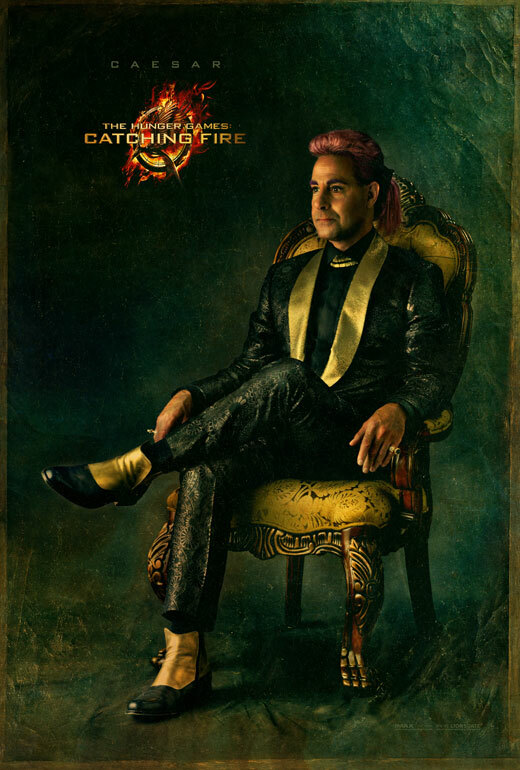 Since the “Victory Tour” poster was released last week (see here), Lionsgate have released some promotional pictures of the characters in high fashion outfits, dubbed “Capitol Couture”. An Instagram page has even been set up to bring the next set of pictures (check it out here). So far we have seen Effie Trinket (Elizabeth Banks), Haymitch (Woody Harrelson), Cinna (Lenny Kravitz), Caesar (Stanlet Tucci) and of course, Katniss Everdeen (Jennifer Lawrence). The shots are brilliant and although they don’t depict any scenes from the movie, it is still exciting! 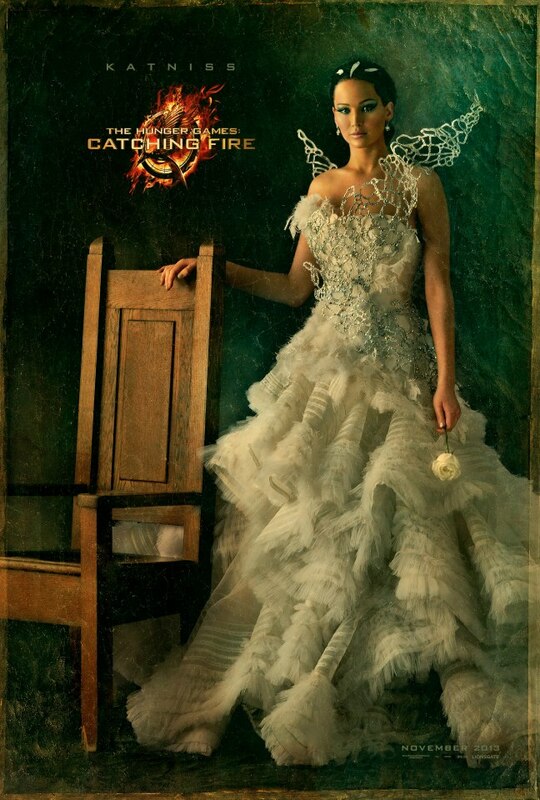 The fashion and the texture of the poster are so good! 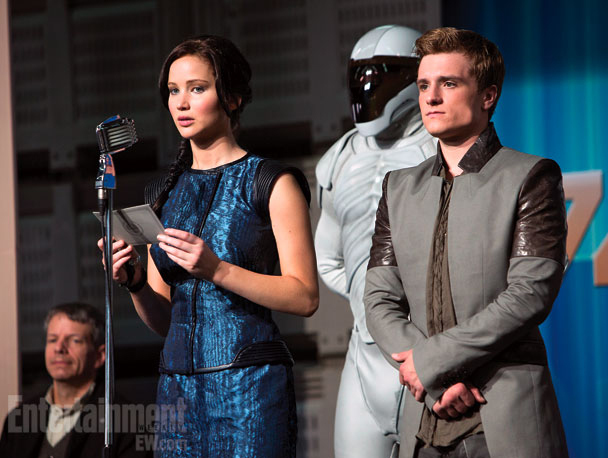 Entertainment Weekly has also managed to get hold of a couple of stills showing Katniss speaking onstage with Peeta (Josh Hutcherson) during the Victory Tour and with newcomer Finnick Odair (Sam Claflin) who is a fellow Hunger Games victor. Why can’t they just release it now?! November is too far away.